I often hear people refer to the Jetsons as "the Flintstones in space". Such people need to be punched in the face - several times. I grew up with and loved both cartoons. They were from an era when humor was aimed at kids and didn't have to have insane innuendoes to keep the parents awake. However, regardless of childhood memories, putting iconic Hanna Barbara characters in video games often leads to awful games. Developers seem to think the IP alone will carry the game. 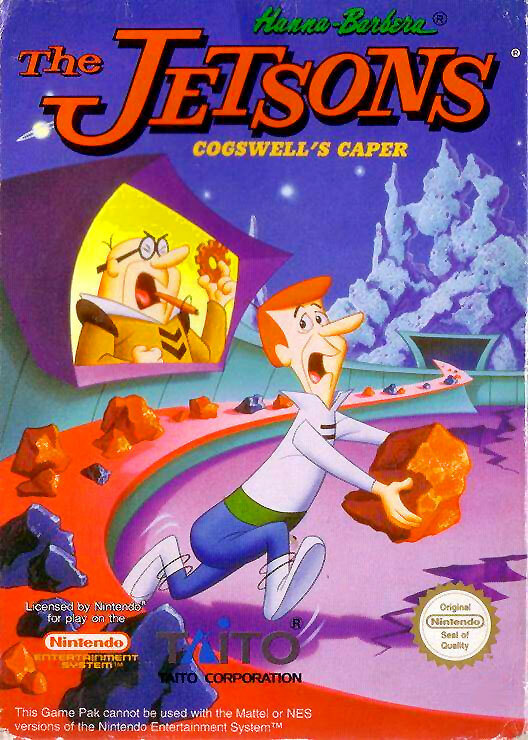 I love the Jetsons, but The Jetsons Cogswell's Caper is a fairly dreadful game. Characters develop over time to the point at which we recognize their decisions, mannerisms and actions as their own. So, when we see a slumped George Jetson flailing about with a jet-pack strapped tight, we tend to wonder what's up. He just doesn't look right when moving or jumping. I'm not calling into question his George Jetson likeness, the figure simply doesn't behave in a human manner. Awakened from a nap by Mr. Spacely, George is told of Cogswell's Cogs and the damage they are causing on Planet M38 via mining. They are mining the ore needed to produce their cogs, but they are treating workers poorly and destroying the planet in the process. The Jetsons were produced by Hanna-Barbera and originally aired in primetime from 1962-1963. Their lives took place in the year 2062. At the time of its debut, it was the first program ABC-TV ever broadcasted in color. In addition to the series syndication, The Jetsons appeared in TV movies, like The Jetsons Meet the Flintstones, and a theatrical release. For Some reason, George is the savior of this situation. Considering he was awakened from a nap to be told of his quest, I'm fairly sure He'd be the last guy most of us would choose to save the planet. However, he's the man for the job and needs to find his family for some much needed help. We mentioned that our hero George looks and moves in an odd manner. The added issue is the physical control. Jumping is haphazard at best. Jumps don't always occur when you want them to... or more importantly, when you push the A button! If I were to stop a disaster on a particular planet, I might start by going to that planet. Georg needs various items for his quest and he needs to obtain them from his family. To track all of this is a stip at the base of the screen that displays his health, stars, and power packs he's accumulated. There's also a display of available remote control defenses. 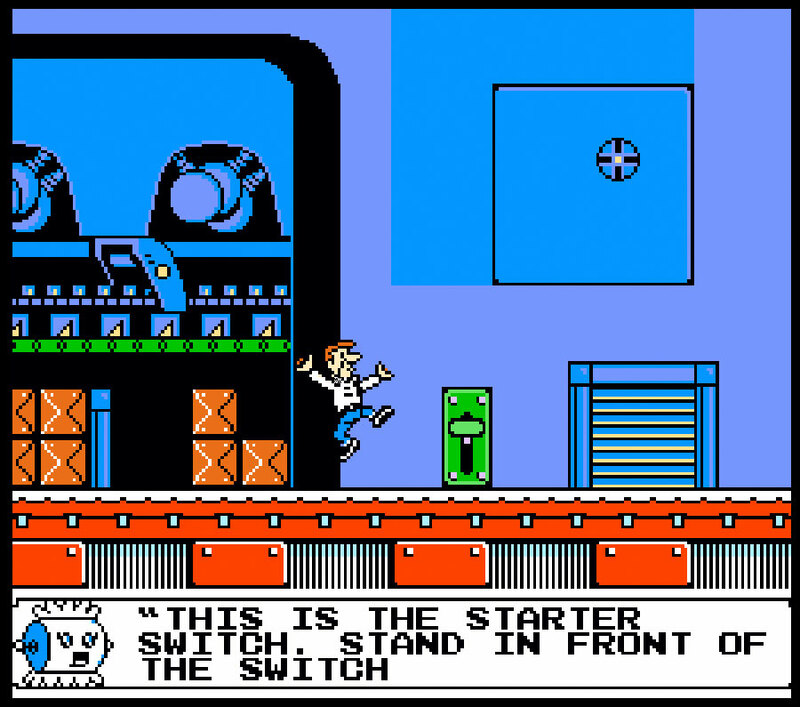 As George travels through this platformer, each of his family members has an item that will ultimately help him defeat the miners on Planet M38. Even Rosie the robot is present and her role is to offer George advice. Similar to the TV show where Rosie was sarcastic, she walks the line between helpful and annoying, but her tips do help. If you have mad passion for the Jetsons and want to steer George along his journey, this game may hold some appeal, but I'd sooner recommend sitting down with a few classic Jetsons episodes and then play a much better game.